I lost my patience entirely one morning. We were running late; my daughter was fussing about me combing out her hair (and many other things), and I gave her hair one yank in anger as I combed out the last snarl. She happened to be sitting by an open window in our house, and our neighbors were out working in their backyard. She screamed as though she’d been struck and burst into passionate tears, her weeping and sobbing carrying out the screen into the open air. I said more things in anger, ugly things. I was astonished at my own anger, how quickly I’d lost my cool. After she left for school, I prayed and confessed, feeling the weight of guilt, but trying to claim the truths of the Word – that “if we confess our sin, He is faithful and just to forgive us our sin and cleanse us from all unrighteousness” (1 John 1:9). At lunchtime, I surprised her at school in the cafeteria with lunch. I looked her in the eye and told her I was sorry for my outburst that morning. We hugged and had lunch together. Mommy sins, too. My daughter will know this. I hope it will help her when she is in the pressure-cooker of motherhood one day. 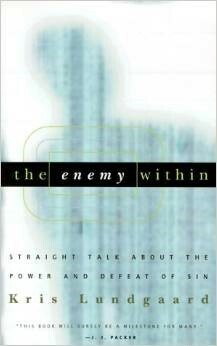 Not 24 hours earlier, I was reading The Enemy Within by Kris Lundgaard, subtitled “straight talk about the power and defeat of sin.” Apparently, God wanted to give me more than a textbook lesson. I’m a pretty visual learner, and He gave me a hands-on opportunity to learn about the power of sin to take us by surprise and defeat us, as it certainly did to me that morning. When Paul writes of Satan’s attempts to defeat the newborn church, he writes, “We are not unaware of his schemes.” We, too, must be wise to the workings of sin within us as we battle the flesh and seek after God, knowing it is His grace working within us to help us overcome. 1. Sin resides in our flesh and resists the things of God. Have you ever resolved to read your Bible, only to open it and find your mind flying to every other thing? Have you ever determined to pray about something, only to find your body wants to fall asleep instead? You have witnessed the flesh in action. The flesh resists the things of God, which are Spirit-wrought. Knowing this helps us fight for spiritual growth. In 2 Cor. 2:11, Paul mentions that he is aware of Satan’s schemes. Knowing the tactics that come against you helps you to combat their potency. Expect your flesh to resist when you determine to grow spiritually. In my case, I had just renewed my desire to arise early and read my Bible, something I had long neglected in the exhaustion of parenting. The outburst with Abby came on Day 2 of my new initiative. I do not think it was an accident. 2. Sin takes cruel advantage of our weakness. My outburst with Abby revealed something to me I did not realize: I was weak. I needed some respite. We’d had sickness in our house, and I’d missed Easter and weekly fellowship with believers. I was trying to press on, but I needed to acknowledge my weakness and reach out for help. When my outburst revealed this, I took action to reach out for help that very moment. God doesn’t punish us for our humanity, He gives grace and help in our temptations as we call upon Him. But the flesh and the devil will hit us when we are down, sick, tired, and hard-pressed. 3. Sin deceives. If we saw it for what it is, we would never fall for it, but sin deceives. It looks so good, smells good, sounds good, and tastes good, even in the middle of embracing it, we cannot see the evil of it. This is why we fall into sin—because it deceives us. Then we will be tempted either to rationalize It’s not so bad… Everyone does this… It’s just a little thing… But God sees everything, big and small. Each act of sin is committed quickly and freely, and life flows on like a river, and we think that the current has carried away our sins. But God sees. The stones of our choices cause ripples of consequences in our lives, spiritual and otherwise. But God provides greater grace. Through the Word of God and prayer, we draw near to Him. We repent.He opens our eyes to see the lies. We fight against our flesh to seek Him, and He delights to help us. He delights in our seeking and in our strengthening. We are overcomers in Christ. 4. Sin loves shame. Once we have fallen into sin, the temptation then is to hide in the bushes like Adam and Eve. We think we are the only ones who have ever sinned in this way. What kind of a person sins like this? We asked ourselves. The answer is—all of us. Since the first bite of sin, we all have the same poison at work in us. So we must combat shame by reminding ourselves that we have not fallen into any temptation except what is common to man. After yelling at Abby, I could have wallowed in guilt and shame. But instead, I chose to believe in forgiveness and remember that this is sin but it’s not shame. Shame takes sin from an incident to an identity. You’re a horrible mom for losing your temper like that. We must be careful to push it back where it belongs, covered under Christ’s atonement. His identity is ours—beloved child. His obedience is mine—faithful servant. If you find yourself in a season of defeat against the onslaught of sin, I highly recommend Bible reading, prayer, confession to a trust brother or sister in Christ, and this book The Enemy Within by Kris Lundgaard.